(Newser) – The world's population was 7 billion in 2011, and it's already set to hit 7.2 billion next month, the UN says in a new report. 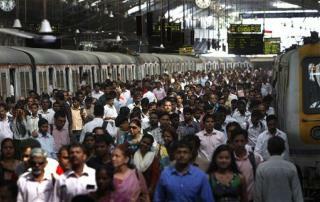 If that seems like a lot, wait a few more decades: By 2100, the population is projected to be 10.9 billion, AFP reports. Most of the growth is centered in the developing world. In the least-developed countries, population is likely to double from a current 898 million to 1.8 billion in 2050 and 2.9 billion in 2100. In developed countries, the outlook is much different: The UN expects the population to climb from 1.25 billion to 1.28 billion by 2100. Ah, the ticking time bomb's explosion grows closer as the earth's resources grow more scarce. Mother Nature has a cruel way of handeling this problem where humans are too ignorant to stop the problem. Worse yet, in what is supposed to be civilized countries medical research is finding ways to preserve birth defects with drugs to make barren women artificially pop out litters of babies that will have the mother's same defects.